Surface registered emboss for a distinctive look that will enhance your decor on every level of your home: on, above, or below grade. The perfect balance between beauty and durability, this 12 mm laminate flooring is the worlds simplest to install and easy-to-maintain , more convenient installation. This flooring solution Installs over concrete sub-floors, perfect for condominiums. Durable AC3 rating ,makes this flooring a great investment. Micro-v groove on all four sides creates a more natural looking floor. E1 certified; means you can breathe easy installing this flooring solution as it will not emit any noxious gases. 25 year structural , 1800-387-8953. This beautifully crafted European-made Laminate Flooring offers the ultimate in style, design, and performance. This flooring is 12mm thick and comes with a 2mm pre-attached underlayment and is also Greenguard Gold certified for healthier homes. The product features a commercial grade AC4 melamine wear layer impregnated with Aluminum Oxide for added resistance against wear, scratches, and stains. This product offers a triple warranty against fading, staining, and wear. This beautifully crafted 12mm Laminate Flooring from Power Dekor offers the ultimate in style, design and performance. These strikingly rich wood decors are finished with an embossed in register finish, giving your floor an authentic appearance and underfoot feel. This product features a commercial grade AC4 wear layer for added resistance to wear, scratches and stains. A patented Uniclic<sup></sup> glue less locking system is used to ensure a quick and easy installation. This product can be installed over radiant heat, on, above or below grade and is covered by a 35 year residential warranty / 5 year light commercial warranty. Presented by Home Decorators Collection, Hand-Scraped Hickory's tanned texture and deep brown colour achieve the look of real hardwood, adding rustic beauty to any room. Its durable and ultra-strong AC4 wear layer protects against scratching, fading and staining, paired with a Limited Lifetime Residential Warranty to ensure decades of lasting beauty and functionality. Appropriate for both residential and commercial uses, it also features a user-friendly locking technology to ensure quick and easy installation in your home or business. 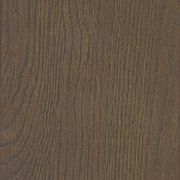 12mm Thick x 5-inch W Dark Oak Laminate Flooring Surface registered emboss for a distinctive look that will enhance your decor on every level of your home: on, above, or below grade. The perfect balance between beauty and durability, this 12 mm laminate flooring is the worlds simplest to install and easy-to-maintain , more convenient installation. This flooring solution Installs over concrete sub-floors, perfect for condominiums. Durable AC3 rating ,makes this flooring a great investment. Micro-v groove on all four sides creates a more natural looking floor. E1 certified; means you can breathe easy installing this flooring solution as it will not emit any noxious gases.